India and the United States say that they have finalised a deal on civilian nuclear co-operation, which would end three decades of US sanctions. A statement released by both sides described the deal, which has been held up in negotiations for two years, as a "historic milestone". The deal guarantees India fuel supplies for its civilian programme, and allows it to reprocess spent fuel. India denied it would use the deal to expand its nuclear weapons programme. India's National Security Adviser MK Narayan said: "We are not using it as an excuse to enhance our strategic capabilities." Nicholas Burns, US undersecretary of state and chief US diplomat at the talks, said that the agreement would "liberate our two countries for a new engagement". India said the deal did not cover the question of whether it had a right to carry out nuclear tests. 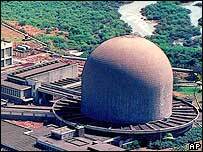 "This deal deals primarily with civil nuclear co-operation," MK Narayanan said. "If there is a test we will come to that later on." The deal means that India will get access to US civilian nuclear technology if it opens its facilities to inspection. Critics say the pact could encourage India to build its nuclear weapons arsenal, and that it sends the wrong message to countries like Iran, whose nuclear ambitions Washington opposes. It has also faced opposition from the communists and opposition parties in India who have argued that the deal could undermine the country's sovereignty. But supporters of the accord say it will help India meet its soaring energy demands by reversing three decades of US sanctions, imposed after nuclear tests were carried out by India in 1974 and 1998. The implementation agreement, or "123 agreement", is designed to include all operational aspects of the deal, which its supporters say will galvanise strategic ties between the world's two biggest democracies. Before it takes effect, the finalised deal must be approved by the US Congress, while India needs clearance from the Nuclear Suppliers Group of countries.